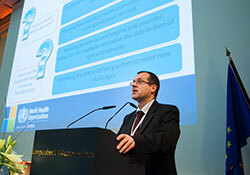 Speaking at the World Health Summit, held in Berlin, Germany on 21–24 October, Dr Hans Kluge, Director of the Division of Health Systems and Public Health at WHO/Europe, described how some countries adapted their health systems to take account of the NCD epidemic and an ageing population, in the face of falling growth rates for health expenditure. Lithuania and the Republic of Moldova, for example, introduced new financing arrangements so that a fall in health-insurance payroll contributions triggers general budget transfers to compensate. This enables the countries to maintain services and support vulnerable groups unable to contribute financially. Latvia initiated budget cuts and structural reform concurrently, shifting priority to primary health care, coverage of essential medicines and outpatient specialist services. Improving efficiency is key, noted Dr Kluge, to reduce the adverse effects of the financial crisis and to secure popular and political support for future spending. Efficiency measures include eliminating ineffective and inappropriate services, improving the rational use of drugs and allocating more to primary and outpatient specialist care and less to hospitals. During an interview broadcast on national German television after the Summit, Dr Kluge underlined that containing the costs of health services is not the answer; countries should protect what works well and use the financial crisis as an opportunity to pursue needed system reforms. Ensuring that the poor and vulnerable are protected amidst such reforms is vital, and in line with the social values enshrined in the Tallinn Charter: “Health Systems for Health and Wealth” and Health 2020, the European policy for health and well-being.